Someone at Pet Gear had to have asked, “Are we sure we want to do this?” What would you have said when a co-worker threw out the bone-headed idea for The Pet Gear Clip-On Pet High Chair. As of 2:00 p.m. this past Tuesday, my kids are out of school for the summer. Their elation is quite infectious, I must admit. Now the question comes: What will we do? Our motivations are twofold. The first is financial. Camp is expensive. So much so that we don’t want to pay for it this year. But our main motivation is time. Weekly chores. Yes, chores. I know this is supposed to be fun but everyone has to help out. You’ll notice my wife and I have assignments on there, too. Daily chores. My son’s list includes feeding the dog, clearing the dishes from the table, and picking up his stuff. My daughter must walk the dog, clear her dishes, and do some reading. The summer rules. These are pretty basic. “Be nice to everyone or be alone in your room.” “Respect others, their sleep and their stuff.” They love to wake up at 6:00 a.m. and then attempt to have a conversation with my unconscious body. Not fun. “No fun until chores are done.” My wife is not kidding about that one. The Summer Wish List. We all took sticky notes and wrote down a few things we’d like to do, like visit Boston, establish a family game night, camp out in the back yard, have a movie night, swim in the lake, take a fishing tip, go mini golfing. More can be added at any time by anyone. We did it! 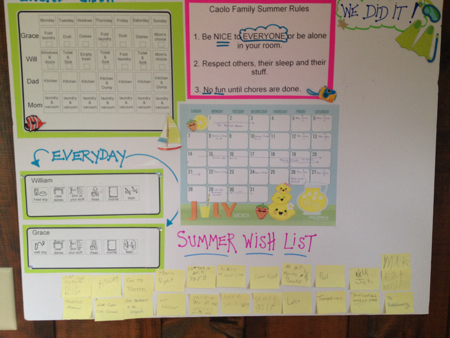 As we complete the fun activities, the sticky note is moved to the “We Did It!” section. At the end of the summer, we’ll have a nice record of all the awesome things we’ve done. That’s pretty cool, but there’s more. My favorite thing is The Boredom Jar. 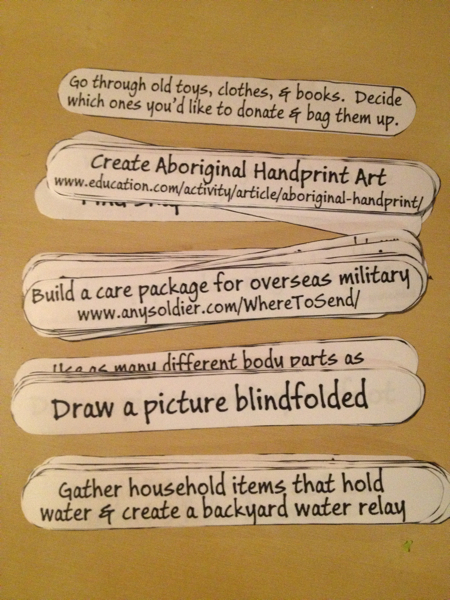 My clever wife has printed many wonderful answers to “What can I do?” onto thin strips of paper. These will be glued onto tongue depressors and stuck inside a mason jar (there are 40 options in total). Now, when we’re asked “What can I do?” we can invite the kids to pull a stick from The Boredom Jar. Finally, we took the kids to a craft store last week and let them select a journal/scrapbook. They’ll be adding photos, souvenirs, writings, drawings, etc. to them as our summer progresses. This is going to be fun and I’m looking forward to it. Adding items to the wish list is great and gives all of us goals for the summer. Plus, The Boredom Jar should be a real boost to the kids’ fun and our sanity. Here’s to a successful Camp Caolo. I’m wondering if the person who invented this for Cuisinart has ever actually grilled a food item. I say this because anyone who has used a grill before knows that it has a rack inside of it that conveniently holds food for the purposes of cooking. You put food on the rack. That is how a grill works. Really. I’ve done it before. Best of all, that rack inside of your grill can hold way more than four potatoes! Yay! Now get out there and put potatoes directly onto the rack already inside your grill. Thanks to reader Jess for sharing this completely unnecessary unitasker with us. Reminder: If you are still using Google Reader as your RSS feed reader, you’ll need to jump to a new program this week. Come Monday, July 1, Google Reader will no longer exist. Check out our recommended alternatives if you still need to make a switch. My mom was the perfect example of a fake unclutterer. She had every closet crammed with stuff, all categorized and neatly organized in plastic boxes. It didn’t look bad until you pulled it all out and realized just how much junk she saved. Yes, junk–hundreds of neat little bundles of twist ties for one example. All useful junk in reasonable quantities, but several lifetime supplies of pens, pencils, sewing needles, thread, chopsticks, notepads, letter openers, grocery bags, paper coasters, tape, hotel soaps and shampoos, ad infinitum. Family dynamics aside, I suspect many people have their own notion of what it means to be an effective unclutterer as well as what the opposite looks like. The underlying impression of the latter is that you’re not really ridding yourself of clutter. Even if you move your stuff to a different location, hide it, or make everything look neater (though a reasonable first step), it is still clutter. If the items are useful but not used by you, that’s clutter, too. It can be a tricky endeavor to figure out where to store everything you own and that’s probably why some things still linger throughout your home. You might feel sentimental about a few items or you might keep something even though you don’t want it because it was received as a gift. Maybe you think you might use it someday. In addition, when you don’t use something often (or at all), it may not be clear where it should be kept. There’s no framework for how to store and access it. So, if you find yourself surrounded by (or are hiding) items that you’re not using, look at the reasons why letting go is difficult. Your reasons for holding onto things can help set the stage for creating a successful plan for letting go of real clutter. Before sorting through your stuff, create a plan with steps that you can follow through on easily. For instance, your plan might include working in microbursts to avoid getting overwhelmed. You may also want to work during times when you are most alert and focused (so, if you’re not a morning person, you likely won’t be productive during early morning hours). Each of these strategies can work very well when they are incorporated in a regular routine. On the other hand, you’re not likely to see consistent results if you don’t commit to taking action on each item. If you begin to feel stressed or overwhelmed, resist the temptation to shuffle things from spot to spot or to put them in closet. What’s the likelihood that you’ll use the item and how often will you use it? Is that item essential to getting things done? Can someone else benefit from having it? Is it still in good working order? The questions you ask yourself will vary depending on the things you need to act on, so consider the purpose of each one so that you can let them go. If you still have trouble deciding, you might want to work with a friend who is a good accountability partner (or professional organizer) who can help you through the decision-making process. Letting go of things that are not useful to you or that you don’t want doesn’t have to be a difficult process. Set aside some time each day (or as your schedule allows) to sort through and decide what to do with these items so that you can free up your space for things that you do use. Today’s guest post is by Amanda Scudder, Organizing Consultant with the company Abundance Organizing. Please give her a nice welcome. There is a Yiddish folktale about a man whose house is too small and noisy. Seeking a solution, he consults the wise woman of the village. She advises him to bring a chicken into his house. He does, but it makes his house seem even smaller and louder, so he again seeks her council. She tells him to add a goat. Not surprisingly, the goat makes the situation worse, not better. Each time he returns to complain, she tells him to bring another animal into the house. Finally, in exasperation, he returns to the wise woman and tells her that he can’t stand another minute of living in this increasingly cramped, cluttered, and noisy house. She smiles and tells him to go home and let all the animals out. He does so and as he shoos the last goat and chicken out the door he looks around at his now spacious dwelling and savors the calm quiet that surrounds him. Not unlike this man, many of us find ourselves living in a space that feels cramped and chaotic. Our closets are overflowing, our children’s toys are everywhere, and our basements are jam-packed. So we add more — bigger closets, a larger house with a playroom, a storage unit to hold the overflow. But the more we add, the more chaotic things seem to get. Take a minute to think about the “animals” that have come into your home over the years, be they more stuffed animals than there are days in the year, clothes that no longer fit or flatter, gadgets that sounded good on TV but now sit in a corner collecting dust, equipment from hobbies long forgotten, or more activities and commitments than you can reasonably accomplish. Some of the “animals” might even be day planners or organizing products you’ve brought home hoping they would make your life less busy and cluttered. I suggest that today is the day to start shooing those animals out. You don’t need to evict all of them at once. Even a few less chickens and goats will make a big difference. Where to start? Pick a number — any number — and find that many items in your home to let go. You make the rules — it could be 23 things from the junk drawer (bread ties count) or 8 unused condiments from your refrigerator or 16 items of clothing or 5 things from under your sink. The trick is just to do it. I’m willing to bet that when you are done, your drawer or refrigerator or cabinet will seem a little bit bigger. You will feel a little bit lighter. Commit to repeating this exercise on a regular basis and you will soon find that your house is calmer and less cluttered. You might even discover that you don’t need a bigger closet, house, or storage unit once the excess has been removed. When you first start practicing this exercise, you may worry you will regret giving some of your “animals” the boot. If so, here is a strategy to help: Put the items you are evicting into a bag or box marked with the date. Put the bag or box in a closet, basement, garage, under the bed, or any other out of the way place. On your calendar, mark a date one to three months down the road. If, by that date, you haven’t needed anything in the bag or box, commit to letting it go without looking in it. You may even have forgotten what is in there. Kids often create an enormous amount of artwork — and then there’s the huge volume of schoolwork they come home with, too. Keeping it all would be overwhelming, but how do you decide which things to keep? Kids often draw the same thing over and over again. How many nearly identical pictures of cats or superheroes do you need? Consider just keeping representative samples done over the years, which show how your child’s art has evolved. Today my daughter made 20 portraits of her baby sister, but I only kept one that she called her “favorite.” More likely than not we’ll keep it on the fridge and throw it away when another replaces it tomorrow. Or maybe, just maybe, this will be the one we’ll frame and hold on to for years to come. Maybe. You probably don’t need to keep two different handprint crafts made during the same week. Your child’s hand has not grown in 48 hours. Pick the cutest one and toss the other. Drawings your children create out of their imagination will be more meaningful than those where they just filled in the colors in a coloring book. The essay entitled “My Summer Vacation” or “My Family” is probably more meaningful than the essay on George Washington. Weekly spelling tests can probably be tossed, but a few samples of your child’s handwriting over the years might be fun to keep. Other likely keepers are the papers (artwork or schoolwork) that showcase your child’s personality and talents. If your child decided to write the essay about George Washington in haiku, it might well become a keeper. Anything that’s three-dimensional is going to be harder to store than simple pieces of paper. You may well want to save some of these projects, but for others, it may work fine to just take a photograph of the art. Consider having your child hold that artwork when you take the photo. Your children may have their own ideas about what is worth saving. If a particular piece is especially meaningful to your child, it’s probably a keeper, along with a note explaining the significance, if it’s not obvious. Once they’re through with it, they may lose interest in it very quickly. The process is more important than the product for the child. But Burton also notes that doesn’t necessarily mean they want to see you toss the art into the trash hours after they create it. Most people enjoy seeing a representative sample of the work they did as children. But too many papers takes away that joy. A friend of mine was just given a GIANT box of old art and school papers and she cried. Not from joy or sentiment, but from the burden of having to deal with it. It’s now collecting dust in her basement. I use the “ahhh …” test, and keep things that really tug at my heartstrings. It’s the original artwork or the creative writing stories that are most special to me. Spelling tests and math worksheets just don’t have the same tug, but we might keep one or two of those, just so we can see how things change from year to year. By including my child in the process, I also make sure we keep items that are meaningful to her. Glitter is one of the most evil craft products in existence. Most often, its users are children under the age of 10 who have no business decorating with the vile stuff. Once a glitter container is opened, glitter infects every possible thing it comes near. Does anyone ever garner enough joy from these sparkly bits to warrant the clean up afterward because those sparkly bits get everywhere? My guess is: no. Want to know what cleans up glitter well? Vacuum and tape. You vacuum up as much as possible and then you use a strip of tape to pick up the rest. 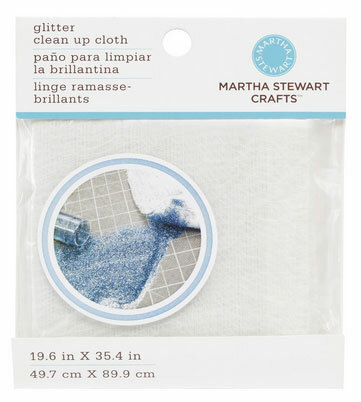 For those rare moments you choose to use glitter (obviously when you have amnesia and have forgotten how messy the stuff is), you don’t have need for a specialized cloth. You probably already own a vacuum and roll of tape, so now is the time to put them to their best use possible and get rid of the glitter. Honestly, I think the best advice I can give you is to not use glitter. Whomever invented it was clearly a mad scientist insisting on overtaking the world with sparkle. Thanks to the person who tipped me off to this unitasker — sadly, I cannot find our original communication, but I am still very appreciative! Dropbox is a service that offers online storage of your stuff. It’s tremendously convenient and used by lots of people world wide. Dropbox is a quick-and-dirty sharing and backup tool that many workers (including yours truly) couldn’t work without. What many people don’t realize is that Dropbox is capable of a lot more than drag-and-drop storage of your files. There are numerous cool things you can do with it, but the following are 10 useful tricks I’ve discovered to help keep me organized and reduce my digital clutter. My personal computer is a MacBook Air with just 128 GB of storage. I know that sounds like a lot, but with a bulging music collection and photo collection, it gets full pretty quickly. Fortunately, my work computer can hold much more. I can hand pick which files get synchronized to Dropbox and then to my MacBook Air, and which get ignored. To do this, open the Dropbox preferences on your computer. Select the advanced tab and then click Selective Sync. From there, tell Dropbox which folders to sync to that computer. Those you choose to ignore are still available at dropbox.com, they’re just not automatically synched. You still have access to them. Dropbox offers one huge benefit that many people overlook. It saves versions of your files for up to 30 days. That means, for example, if you make changes to a Word document you’ve got in Dropbox and then decided you wish you hadn’t, you can restore a version that existed before you made all of those regrettable edits. Go to dropbox.com and find the file. Right-click on it and select Previous Versions from the resulting menu. A list appears; select the one you want. Easy. This is a very nice feature that was introduced within the last year or so. Dropbox for iPhone and Android can automatically move a copy of every photo you shoot to a folder on the service. Check your mobile app’s preferences for the setting to enable this. It offers real peace of mind. I do this one quite a bit, especially when traveling. As you know, Dropbox stores your stuff on its servers. However, if you mark a file as a favorite, a copy will be downloaded to your mobile device, allowing you to view it even when you don’t have Internet access. To mark an item as a favorite, simply navigate to it on your tablet or smartphone and tap the star icon. “Ack! I didn’t mean to delete that!” No worries. If you delete a file, versions from the last 30 days remain. To get something back, go to dropbox.com and navigate to the folder where it used to be. Find the Show Deleted Files icon and click it. Then select it from the list. I use Dropbox to back up every post I publish to my blog. There are at least two ways to do this. I use a service called IFTTT, or If This Then That. You can use IFTTT to build actions or recipes to accomplish tasks for you. I have one that watches for any new post I publish to my blog. When it finds one, it copies the text to a file in my Dropbox account. If worse came to worst, I’d still have all of my posts. If you don’t want to fiddle around with IFTTT (and you own a WordPress blog), check out this great plugin for one-click backups. Here’s a great tip that’s reserved for you Mac users. You probably know that you can turn nearly any file into a PDF by choosing Save to PDF when printing something. What you may not know is that you can direct that PDF to save right to Dropbox. When you click Save to PDF, you’ll see Edit Menu as the very last option. Click it, and then click the “+” in the resulting window. A new list appears. Navigate to your Dropbox (or any folder therein) and then click OK. Now, that folder will appear in the Save to PDF menu every time. Simply click it, and a PDF will be automatically shuffled off to Dropbox. Here’s another IFTTT trick. I’ve created a recipe to monitor my Instagram account for new photos. Whenever it finds one, it moves a copy to a folder on my Dropbox account. The photograph is backed up and I didn’t even have to lift a finger. Pancake.io is a free service that lets you publish a blog or website right from your Dropbox account. It’s quite simple to set up and you can find all the details on how to do it on the Pancake site. If all decisions were easy to make, we’d probably save time (for the things we love) and we’d likely have less clutter, too. In that ideal world of easy decision making, we’d know what to do with everything we own and we wouldn’t scratch our heads trying to figure out where to store our things. Gone would be the days of delaying decisions because of uncertainty. And, we’d probably have fewer opportunities to procrastinate. …when faced with a decision, we should assess how long we have to make it, and then wait until the last possible moment to do so. He goes on to say that if/when we do this, we’ll ultimately be happier. I’m not inclined to agree with those sentiments, but he makes an interesting distinction between active procrastination (doing important things you also need to get done) and passive procrastination (like watching TV, playing video games). Basically, he says that it’s not really procrastination if you choose to do something of higher value (like spending time with family, restocking the first aid kits, organizing/clearing pathways) than the project or task you should be currently addressing. While there may be some merit to that, if you’re on a tight deadline because you’ve significantly delayed getting started, you really do have to focus on the tasks at hand. Though practicing the “art of delay” can help your productivity (like waiting to respond to emails at specific times during the day), when an important and urgent project comes calling, even active procrastination needs to be put on the back burner. But, if you find that you’re cringing at the thought of getting your important tasks done, why not use that delayed time to your benefit? Instead of choosing to focus on trivial things, use that time to think through how you’re feeling, to figure out why you may be feeling stuck. Perhaps you don’t have enough information to get started or are not sure how to begin? Is it possible that you’re putting on your perfectionist hat and waiting for the theoretical right moment? Maybe you really do want to focus on something else that’s of more interest to you. No matter what the reasons are, if you can figure them out, you’ll be in a better position to start looking for ways to turn things around. You can use that time to come up with a plan. If you tend to put off working on a specific task, it could be because you don’t value it very much or you just don’t like doing it. This can be an opportunity to call in reinforcements and help can come in a variety of forms. Perhaps you just need to call a friend who can give you a much needed nudge. Or, maybe there’s a colleague who can handle a portion of the project (the part that has you stuck) so you can focus on the rest of it. Using a pro vs con list can probably help, too. Thinking about all the aspects of waiting until the last minute can give you a different perspective. What are the super cool things about delaying the project? What are the evil consequences? Seeing the good vs evil reasons in black and white just might be the motivation you need to get going (and so can a change of environment). If you notice that you’re continually putting off things that you need to do on a recurring basis, you may want think about whether or not the projects you accept (or are assigned) are the right fit for your skills and interests. It’s not realistic to think that you can only work on things that you like or are passionate about, but if you find that you’re consistently having negative feelings about particular activities and, as a result, delay working on them, it’s time to identify tasks that interest you even nominally. Where possible, make some adjustments. This may require additional planning and involve others depending on the nature of the tasks (personal vs work). Though procrastination is generally frowned upon, it can be beneficial if you use that time as an opportunity to think through a plan to get things done. While you may not be able to make changes straight away, you can brainstorm ways to curb the tendency to put things off until the last minute.